Dogs don’t really care where they shed and I’ve had trouble removing dog hair from my Nan’s chair. It’s been a nightmare the entire time and we had to call a professional. Luckily Your Cleaners Liverpool cleaning company had a time slot open for the weekend so we didn’t have to wait 3 days for a cleaner. They came, they cleaned all of the dog hairs and a couple of crumbs here and there and they did a fantastic job. 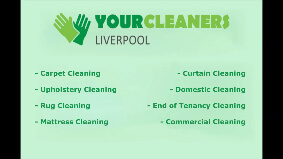 For a fraction of the price of other carpet cleaners, Your Cleaners Liverpool managed to clean my entire living room and they were spotless. I’ve had to call them a couple of times before and each time their work has been impeccable, with friendly customer support and true professional attitude towards customers. Through a friend of mine I learned about this service and have been using it ever since. They have proven to be great help in times of need, during a weekend in December at 6AM. I am very happy with them. This is my 3rd time calling them and booking a treatment and so far I’ve used their carpet and curtain cleaning. Both of the times they have done quite well with the stains, with only a few small blotches being visible. This carpet cleaning company did all they could and the amount they managed seeing as the state of the drapes wasn’t that great is astounding. It’s a wonder what the carpet cleaners they sent were able to remove. The rug wasn’t in great condition in the first place and the way they approached the situation was quite professional. I was expecting a steam rug and carpet cleaning with a hoover, they used some powder and managed to remove a great majority of the filth from it. Now my rug looks better than many years befor. It turns out these guys are very sought after, so I was surprised when I got a time slot in the morning. I’ve ha the pleasure of booking their mattress and carpet cleaning services before and I am glad to see them doing well for themselves. A great cleaning service deserves great success, I am a loyal customer who is grateful for the help.